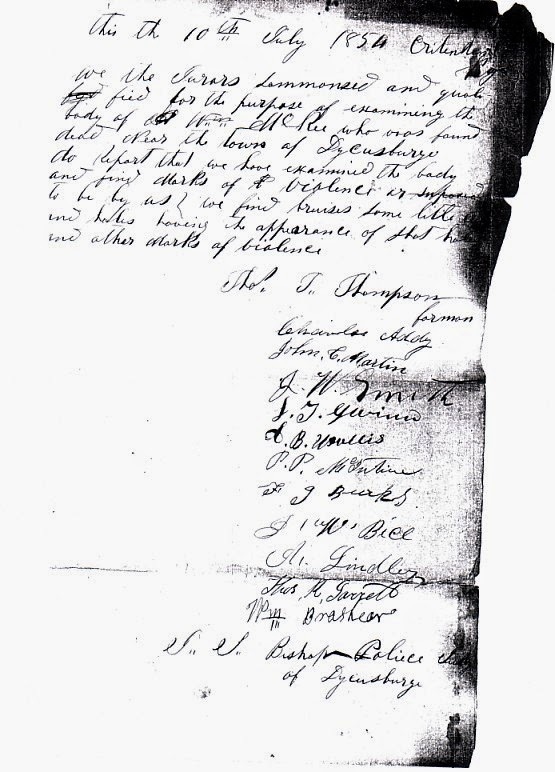 "this the 10th July 1854 Critenden Co Ky: We the Jurors Sommoned and qualified for the purpose of examining the body of Wm. McKee who was found dead Near the town of Dycusburg do Report that we have examined the body and find Marks of Violence or suposed to be by as we find bruises from little cuts and holes having the appearance of shot holes and other Marks of violence." [signed] Thos. T. Thompson forman, Charles Addy, John C. Martin, J.W. Smith, L.T. Gwinn, A.B. Wallis, P.P. McIntire, F.J. Burks, J.W. Bice, A. Lindley, Thos. R. Jarrett, Wm. Brashear, J.J[?] Bishop Police Judge of Dycusburg. Special thanks to Brenda Joyce Jerome for sharing. Visit her Western Kentucky Genealogy blog for a wealth of interesting stories and tidbits of history and genealogy of this part of the state.